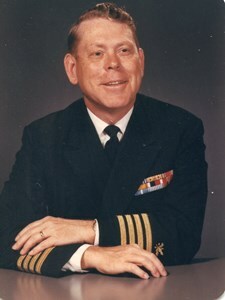 Captain Warren G. Hopkins, USN Ret. Warren G. Hopkins, Captain, U.S. Navy, Retired, age 98, of Olathe, Kansas passed away April 14, 2019. Visitation will be on Thursday, April 18, from 10:00-11:00 a.m. at Penwell Gabel’s Olathe Chapel with a memorial service following at 11:00 a.m.
Warren was born March 11, 1921 in New Lancaster, KS. He lived and attended schools in Stanley, Kansas and graduated from Pittsburg State University in 1943. He entered into the U.S. Navy as an Ensign in 1943 and served his country for 32 years in World War II, Korea, and Vietnam. He retired in 1974 with a rank of Navy Captain. He was awarded numerous medals including the Meritorious Service Medal. He was a life member of the Military Officers Assoc and past president of Epsilon Chapter Sigma Tau Gamma Fraternity. He was an avid golfer. Warren was preceded in death by his parents Earl and Stella Hopkins; and his sister, Geraldine Rogers. Survivors include his wife, Phyllis; brother, Leonard Hopkins; sons, Mark and Paul Hopkins; daughters, Julia (Eric) Buckland, Christine (Jon) Holbrook; two grandchildren, Kate (Kurt) Greisser, and Tyler; one great grandson, Kyle Greisser; Two step-daughters, Debbie (Mike) Wadhams, and Susan Wilson; four step grandchildren, Karen Wadhams, Lori (Jason) Patterson, Cameron Wilson, and Casey Wilson; two step great grandchildren, Devin and Lanay Patterson. In lieu of flowers, memorial contributions may be given to The Salvation Army or to a charity of your choice. To leave a special message for his family or to share a memory of Warren, please click on the "Share Memories" tab above or scroll down below. Add your memories to the guest book of Captain Warren Hopkins, USN Ret..